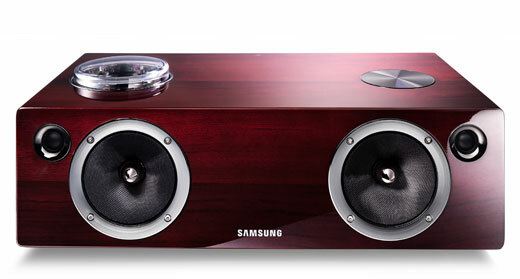 Samsung’s novel ‘valve’ wireless speaker system rings Gary Steel’s bells. (Ashley Kramer’s review of the DA-E750 can be found here). WHEN I FIRST scoped Samsung’s premium “valve” iPod dock at a launch event earlier this year (read about that here) I was skeptical. The Korean company these days most famous for its television panels had gone and incorporated valve technology in the preamp stage of both the DA-E750 dock and the Blu-ray component of its new HTIB (home theatre in a box). Rampant oddness. Surely just a gimmick. 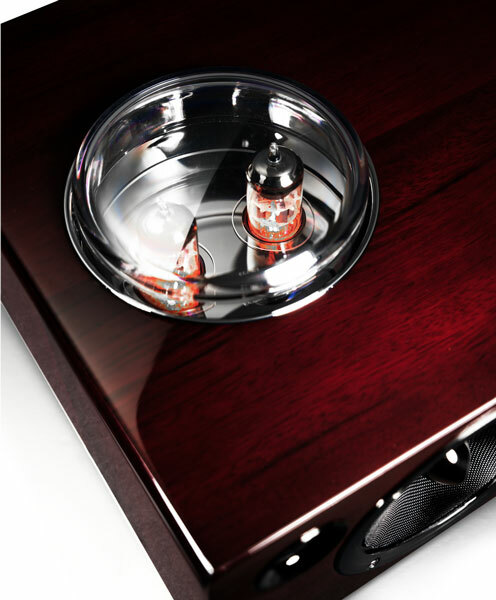 I reviewed that home theatre system here, but although mildly impressed with the set for the price, I couldn’t really see the point of the valve when the speakers weren’t capable of producing sound of any distinction. That didn’t bode well for the Samsung iPod dock. I lost interest, and forgot about it, until they rang and said “take it, have a good long listen, and write, write like a whirling dervish”, or something like that. Let’s get one thing straight: out of habit, I still call these things iPod docks, but really, they’ve now evolved so far from the original idea that someone should come up with a definitive new name. It’s like comparing 1999 mobile phones to 2012 smart phones – they’re still capable of telephonic communication, but that’s about the only connection. So let’s start with the dock, which is at the back and conveniently includes a holder. Happily, in that position it’s out of harm’s way, but it also has support. This dock will play host to recent iterations of Samsung Galaxy cellphones and iPods and iPhones, but it turns out that my 2006 iPod Classic is just too old. That’s something I really hate about technology: guaranteed obsolescence after just a few years. [Oh, and miraculously, there are actually two docks, one for Apple products, and one for the other kind]. When you’re using the dock, it’s really the only visual guide to what’s going on with your music selections, because the control panel is on top of the unit, and doesn’t have any useful indicative lights apart from source options. The remote control is even more basic, and although it’s slim and easy to hold and use, it’s of no use if you want to, for instance, change from ‘shuffle’ to a particular album or song choice; you’re pretty much limited to volume up and down, next track/previous track, and the ability to ramp up the bass. The bass button is a source of some contention, because it’s really useless. It’s really just like the old-fashioned ‘loudness’ button, but when pressed, the bass is so loud that the bass speaker (which is positioned on the bottom of the unit) sounds horrible – pretty much the way Ashley Kramer describes it in his review (which you can read here). I really don’t see the point of this, because the internal amp clearly can’t handle the bass boost, and the carefully balanced sound image is just destroyed… and then there’s the inevitable bass ‘lag’ as well. There’s seemingly no way the user can manipulate the bass or treble in gradients; just this one immutable, ugly step-up. The obvious answer is just to ignore the bass button, because the factory setting is just about right for most music, in any case. But we’re talking about sound quality already, and that’s supposed to come later! Round the back you can connect any other sonic source you wish through the aux input, or insert and access the content on a USB stick, but the really clever action is invisible to the naked eye: it’s an AirPlay device, so it’ll connect wirelessly to your computer’s iTunes library, and it will also connect to your Bluetooth devices. I reckon that it’s probably more likely to be used for wireless music transmission than via its dock, simply because, once set-up, it’s going to prove less physically finickity: I found that having to constantly retrieve my iPhone from its cradle and use it for something else, then connect it to the dock again was a nuisance, but that’s true of all docks. It did also have a few minor hissy fits, like occasionally turning itself off for apparently no reason. There is an obligatory 20-second wait time when you turn it on so the valves can warm up, and I found that sometimes my iPhone needed a bit of coaxing to move from using its own tiny speaker to the Samsung speakers – and by that, I mean connecting and disconnecting, or wiggling it slightly; similarly, when using the auxiliary input, there was a considerable delay before the sound kicked in. But What Does Is Sound Like? 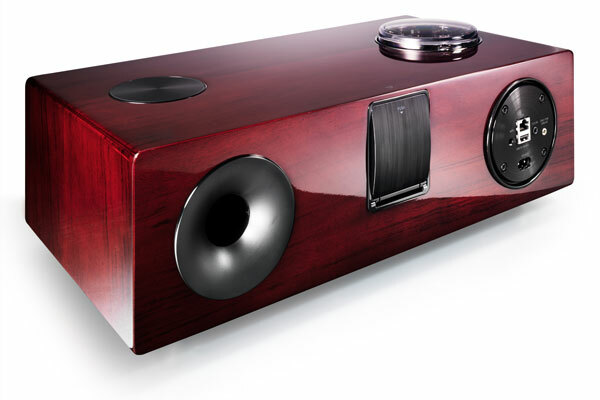 Ignore the rest of the review, if you like, because this is what matters: After my experience with Samsung’s valve Blu-ray player as part of its home theatre system, I wasn’t expecting much of the sound. Oh, how I was surprised! Parked on a wooden cabinet near the wall of my large dining room, the sounds just swam around the room, luminous, liquid and inviting, and sporting an amazingly wide sound stage. Maybe it’s something to do with the A-frame ceiling of my room (although I’ve tested other docks here and never had similar results) but there were times when the stereo imaging was way off to the left or right of where I was expecting it to be contained. I’ve read other reviews of the DA-750 that reckon its sound is rather bright, and that it was better on contemporary rock than jazz or classical, but I found that not to be the case. In my opinion, it’s at its best on acoustic-oriented music. For instance, ‘Jersey Girl’ from Holly Cole’s The Greatest album sounded superb, with its deep, resonant, woody acoustic bass asserting itself without any obvious boom or lag and no obvious tapering off from the range of expressivity of her pitch-perfect vocals. The same was true of Norwegian songbird Emiliana Torrini, whose ‘Birds’ (from Me And Armini) is a wondrous thing with her breathy, fragile voicing and delicate plucked guitar. However, the subtle harmonics buried like tracers within this track, together with the strange, beguiling, repetitive groove that starts halfway through the song, only comes out in the wash on a really revealing full-spectrum hi-fi system… there’s no dock on earth that can quite replicate the detail and depth of that experience. While the dock sounded great on the low-end electronic dub of International Observer’s ‘Zoom Lo Fi’ (from Seen), dealing well with the precisely tuned bass modulations, it fared only marginally less well with Brian Eno’s ‘Persis’ (from Drawn From Life), an ambient/orchestral/electronic dreamscape that can almost produce hallucinations on a “proper” stereo. On this selection, the Samsung showed no particular weakness; it’s just that if you’ve heard it’s widescreen sonic beauty elsewhere, you kind of know what you’re missing. It also acquitted itself well on ‘The Affectionate Punch’, the propulsive title tune from the brilliant 1980 album by The Associates, on which Billy Mackenzie’s voice is like Bowie on steroids. The DA-E750 does rock well, but somehow sounds a bit shrill and clattering when trying to resolve Gwen Stefani’s ‘Hollaback Girl’ (from Love. Angel. Music. Baby), a song that sounds pretty good on most systems I’ve heard it on. I reckon that the sound of the Samsung reflects its styling: serious, muted, smooth, dignified, and that its only real weakness is resolving the booty bass and the various other sonic detritus of modern dance pop music. Its strength, on the other hand, is in its detailing of smooth vocal jazz or smooth, intelligent electronic/dub music. One thing: while the Samsung does go fairly loud, it’s not like a lot of docks that will go as loud as it can while just getting more and more brittle in the sound department. The DA-E750 sound does deteriorate once it gets past a certain point, and at that point, the bass does start to sound glutinous. Once you’ve reached this point, however, the bass speaker is producing so much vibration on the unit itself (and on the dock and iPod/iPhone) that it makes you wonder if the downward-firing bass speaker really needs more isolation from the unit. Despite the reservations stated above, I reckon the Samsung DA-E750 is a winner. No, it’s not a party machine, but aesthetically it’s unbeatable, and musically it almost matches those aesthetics, with a few caveats.